I'm anxiously waiting for Summer to come in full force here. If you follow me on Facebook, you know that we got snow on Sunday morning (May 1st). Snow is not something I was expecting or wanting at this time of year. I'm ready to get out in the warm sunshine, play in our small pool, and enjoy Summer to it's fullest. 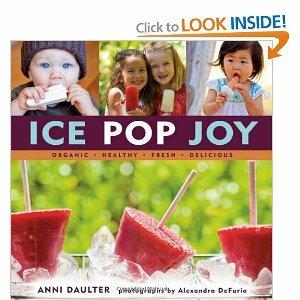 Our family is on a path to better and healthier eating and I'm excited to share that I found a wonderful book by Anni Daulter called Ice Pop Joy which will allow for healthy snacks and treat for the girls, Chris, and myself. Those snacks would be homemade popsicles. 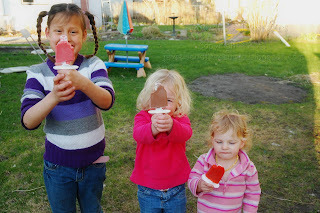 The three girls enjoying their different popsicles! Any of my family can tell you that I rarely will make a recipe without a picture. This book drew me in for it's colorful pictures and deliciously healthy recipes. We made three different pops (Pure Sunshine, Pink Princess, and Choco-Berry Pops). I can tell you that all three were very simple to make and were a huge hit with all of us (including my younger sister who was at our house when we made these). One of my favorite parts of the book is the fact that each page has a health tip at the bottom of the page. I learned so much from reading those tips. My plan is to make some of these each day for the girls to enjoy after naptime. Thus, I am hoping this snow stays away so we can enjoy them to the fullest this summer. I have a goal of trying as many of the recipes as possible! For it's fresh, organic, and healthy recipes, I would highly recommend this book. While I'm not a fan of hiding fruits and vegetables in foods in order for children to eat them, I do believe this book makes the process more enjoyable for all. 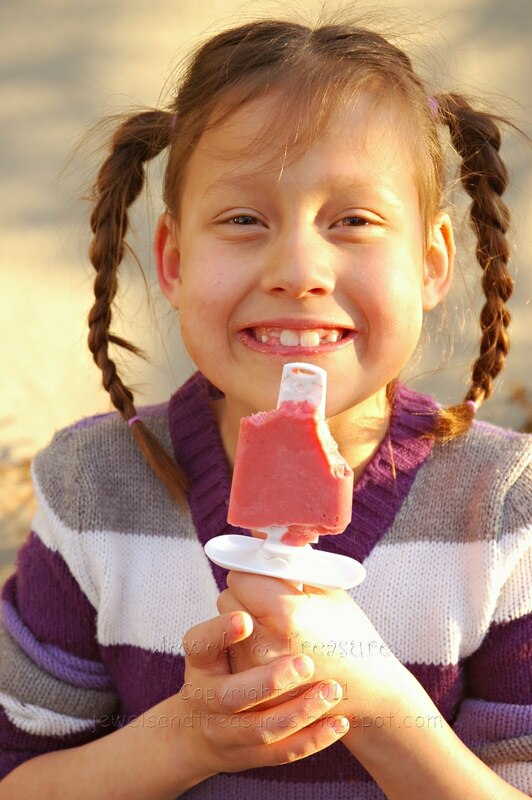 One of my readers has a chance of his/her own to win a copy of Ice Pop Joy! 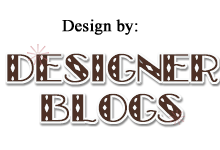 *The featured product(s) in this post were provided to me by the publisher. I was not compensated in any way. All opinions expressed in this review are my own and not influenced in any way by anyone. I would love a mango strawberry. That sounds good to me right now. my favorite from the store are limeade ones...i have never tried to make them but it would be fun to try! My perfect popsicle would be one with lots of berries in it! Any flavor with fresh strawberry. I like of Jewels & Treasures on FB as Audrey F.
I follow with GFC as strawberry. Mine would be lemonade as well with some fresh blueberries.